Note: Only Site Administrators will be able to recover archived profiles. When a child has left your childcare service their profile can be archived. If they are returning or their profile was accidentally archived you may want to recover their profile along with all of their stories and pictures. This article will help you with recovering a child's archived profile. 1: Go to the "Children" tab. 2: Click on the "Archived Children" button. 3: From the list of archived profiles, find the child you wish to recover and click on their name. 4: You can then click the "Recover Profile" button. 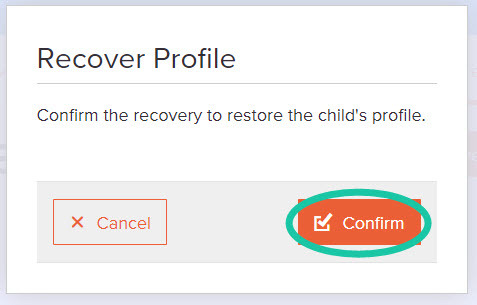 5: Click "Confirm" to recover the profile. The child's profile (along with all of their stories and photos) will now be re-activated and can be found again under the "Children" section.